A man has been arrested after allegedly biting off a wedding guest's fingertip at a reception in Sydney. The 42-year-old intruder walked into the private function at a pub on Saturday night and tried to steal handbags, the venue said. When guests confronted him, a scuffle broke out and he severed a 47-year-old man's fingertip, according to police. The intruder was charged by police with an assault offence. The victim's finger could not be saved, local media said. 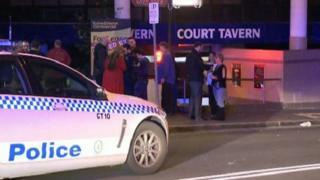 The pub's licence holder, Fred Holovinsky, said experienced staff including a security guard were present at the time. "But when somebody comes and creates a problem, you cannot control that," he said. "(And) when you have got 50 or 60 people who take offence at somebody trying to steal a lady's handbag, how are you going to control that?" The wounded man was taken to hospital for treatment and later released. It was not the only violence on the night - police were later forced to break up a fight outside the pub.